by James Jay Carafano, Ph.D.
Americans are justifiably horrified by conditions in New Orleans. Trying to make sense of this unparalleled disaster and the unprecedented response required to meet it is no easy task. In modern memory, the United States has never experienced anything comparable; there is no standard against which the efficacy of the effort to save lives and property can be judged. The challenge has to be placed in perspective. Congress must keep the realties of responding to a catastrophic disaster in mind as it plans its next steps for recovering from Hurricane Katrina and preparing for future national crises. Anyone watching cable news knows what needs to be done. But watching a disaster on television is one thing, and dealing with the realities on the ground is another. Getting into an area that has experienced the equivalent of a nuclear strike, absent the explosion, fire, and radiation is another. It is a monumental challenge. Estimates of the numbers stranded in New Orleans range up to 200,000. Meanwhile, much of the city is under water. Virtually no infrastructure remains. The problem is not a lack of resources, will, or the organization to provide assistance. The problem is how to get it to the tens of thousands of people who need it. Additionally, every aircraft, vehicle, and team sent into the disaster as to come with its own support package, increasing the logistical burden further. The notion that under these impossible conditions the dire needs of the city could be efficiently addressed in a few days is simply ludicrous. It would be irresponsible to gauge the competence and magnitude of the national response solely by the speed with which resources are brought to bear. How quickly assistance arrives will be dictated by the realities on the ground. For now, here is what we can say about the challenge we face in New Orleans: This is the kind of crisis the federal government must be prepared to tackle—a disaster that exceeds the capacity of state and local governments. As such, it is a fair test for the newly established Department of Homeland Security and the national response systems put in place since 9/11. We should learn from this tragedy whether we have the right kinds of resources and programs in place to provide an adequate national response to catastrophic disaster—either natural or manmade. We should, however, temper our expectations with realism. As Congress returns to deal with this tragedy, its first priority must be to provide immediate supplemental funding to deal with the disaster. Beyond that, it needs to assess whether we are truly taking all the right steps to build an appropriate national system to respond to catastrophic disaster. The current grant system that doles out blocks of money to states with scant regard to national priorities won't do. Today, all the fire stations in New Orleans lie under water and wreckage, as does much of the equipment they bought with federal dollars. Only a national system—capable of mustering all the local, state, federal, and private sector assets needed, built by meeting the highest national priorities first—can respond to disasters on the scale of Katrina. That is a lesson not to be forgotten. James Jay Carafano, Ph.D., is Senior Research Fellow for National Security and Homeland Security in the Kathryn and Shelby Cullom Davis Institute for International Studies at The Heritage Foundation. On the 23rd of August a tropical depression formed out of the remains of an older tropical depression and a tropical wave. Initially there was uncertainty as to what would happen and where it would go. By the 24th Katrina became a named storm and intensified over the next 30 hours as it moved close to the Bahamas, and became a category 1 hurricane around 5pm on Thursday 25th August.A few hours later Katrina makes landfall in Florida between Miami and Fort Lauderdale. Katrina even though only a category 1 storm packed quite a punch bringing 90mph winds and as much as 18 inches of rain over South Miami. Widespread flooding and disruption ensued.Katrina re-emerges over the Gulf relatively intact although temporarily downgraded to a tropical storm on the morning of Friday 26th. Katrina then moves westward out into the Gulf and finds ideal conditions for development. Over the next 48 hours Katrina intensifies benefiting from little or no shear, a ridge of high pressure to the north and very warm seawaters, the temperature of which was around 90 degrees close to the north Gulf Coast. 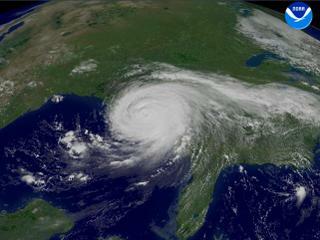 Katrina swings north and bears down on Louisiana. Just before second landfall on the morning of Monday 29th Katrina changes direction and weakens to a category 4. The storm still packed a terrible punch with winds gusting to 140mph, heavy rain, tornadoes and a terrible storm surge. Initially though it appears that the doomsday scenario will not arise. Much damage is done to New Orleans but with the storm passing a little to the east the storm surge is not as bad as expected and the levees hold. Meanwhile southern Mississippi and Alabama take the full brunt of this mighty Category four storm, one of the largest storms in history. Winds pummel the coast and extend inland and the storm surge sweeps in. The storm surge appears to peak around 28 feet with cities such Biloxi, Gulfport and Mobile badly hit. For as much as twelve hours the coast is battered, and tropical storm force winds extend across into the Florida Panhandle. The storm then picks up speed and moves quickly inland through Mississippi eventually being downgraded to a tropical depression on the morning of Tuesday 30th. However it brings heavy rains and gusty winds up into Tennessee. During the next forty-eight hours Katrina weakens and becomes extra tropical. It brings rain to states such as Ohio and Pennsylvania and storms across Virginia, the Carolinas and then on up into the North East. The remains of Katrina then moves up into Quebec before exiting out into the cold North Atlantic. For a few hours after the storm's landfall it isn't clear how much damage has been done. Most camera crews moved inland ahead of the storm and all communication is lost from the coastal area. There are scattered reports of deaths and destruction but no one envisages the horror that emerges in the succeeding days.